When our luxury home, Kauai Vacation Rental at Honu Point, was completed in 2015, I signed up for a subscription with one of the big name vacation rental sites. I paid an annual fee for the advertising it provided. This site offered the guest the convenience of seeing a variety of choices, and communication between the guest and owner prior to booking was encouraged. Booking my home on this site was free to my guests. In 2016 a well-known travel company bought this site, and now it is hard to avoid a service fee without booking directly with a vacation home owner. These fees can be significant. Even if the owner pays the listing site a subscription fee, the site now charges the guest a minimum service fee of 4% – 12% of the rental. “Service Fee” sounds somewhat better than “Booking Commission,” but it is simply a fee the site charges the guest for using its services. There is nothing wrong with a vacation rental site charging a fee for its service, though it tends to irk me that they are getting paid on both ends of the transaction for nothing more than advertising. What is really upsetting, however, is that they are making it more and more difficult for me to communicate directly with my guests prior to booking. They block any website pages or email addresses that I wish to send to my guests, making it very hard to recommend activities and services that might make planning a bit easier. For these reasons, owners are banning together to get the word out about how to book directly the next time you want to rent a vacation rental property. 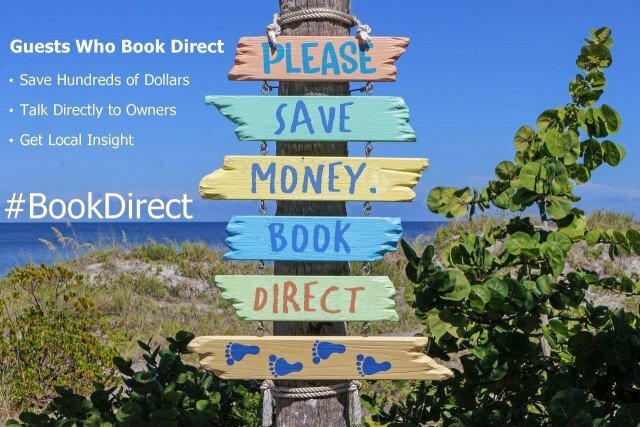 Yesterday was Guest Education Day (February 7, 2018) and #bookdirect is still trending on social media. I still use the advertising site but I wanted to bring awareness to my past and future guests of the choice you have when renting a vacation rental property. As the big sites have tacked on fees, some smaller sites have arisen to compete by charging no service fees. They make their money strictly from homeowner subscription fees. If you want the convenience of seeing many choices while avoiding service fees, look for these sites. Here is one of them that I have started to use. It just launched on January 1, 2018 but it is growing rapidly. Many homeowners are creating their own websites so you can book directly with them. You are reading this article on just such a website: https://honupointvacationrental.com/. 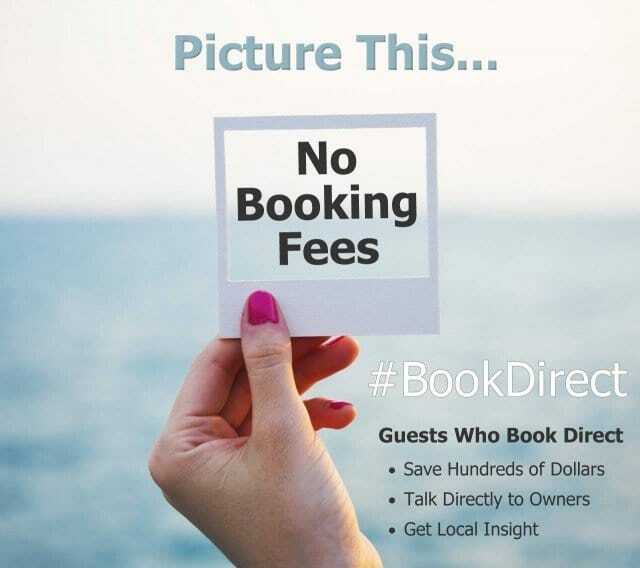 If you book direct, you communicate directly with the owner and will avoid booking fees. But how do you find such a site? Look at your destination on Google Maps. Some rental homes, including this one, will show up. You can see where it is and whether it has a personal website. Search on Facebook for the name and location of your destination to see if some of your favorite properties have a website or a Facebook page. From there you can contact the owner/manager directly. You can find our page, for example, by doing a quick Facebook Search for “Kauai Vacation Rentals by Owner” or visiting us at https://www.facebook.com/honupoint/. Use a big name vacation rental site to narrow down your choices and see if your desired home has a name. If so, plug the name and your destination into your favorite search engine. Please do your own due diligence. Read the reviews for the home in multiple web locations. Talk to the owner by phone and ask lots of questions. Then make your choice on how you would like to proceed with your booking. Do Service Fees Provide You Extra Value? Vacation rental companies advertise that they will guarantee your stay and give you 24/7 support during your stay. But they don’t own any inventory they can substitute, and credit card companies can better help with a money guarantee. Many homeowners will accept credit cards, even when you book directly. Furthermore, how will the big travel sites help you during your stay? Most owners either live closely to their vacation rental or have a reliable source ready to help if needed. I take pride in making sure my guests have the best stay possible. The choice is obviously yours. It does not make any difference to me, the owner. I just wanted you to be aware of your options. Either way, I am at your service when you stay at Kauai Vacation Rental at Honu Point. Here is another great article with tips on booking directly with vacation rental owners, written by an owner with Pocono Mountain Vacation Rentals. Aloha from NoCal. We are an extended family looking for a large home to rent for a Kauai vacation around Christmas week 2018. All together our group is twelve including my parents, my brother’s family and mine. Kids are young adults and two teen girls. We have rented many houses and condos in Hawaii and around the country and will treat your home with respect and likewise courtesy to your neighbors. We don’t need extreme luxury, maid service or rose petals on the walkways but expect and appreciate cleanliness, quality and responsible owners. Please let me know availability and rate for a stay of 7-9 nights between Dec 22 and Jan 1,2019. Thank you. Thank you for your interest in our home. I will send you an email regarding your questions, but for others who may read this comment, our home sleeps a maximum of six people. There is an availability calendar and rates schedule under the tab “Calendar and Rates” on the website page for Honupoint.com.